Since the release of Windows 8, Microsoft has taking cue from most popular desktop and mobile operating systems such as Mac OS X, iOS and Android to requires signing into a cloud service account to take full advantage of the features. Likewise in Windows 8.1, Windows 10 and future versions of Windows OS, users is prominently asked to sign into their Microsoft account to easily access to online email, photos, files, and settings (like browser history and favorites) on all your devices. Prior to Windows 8 such as in Windows 7, Windows Vista and Windows XP, users create local user account which is used only for the particular system, or login using an Active Directory (AD) domain account. The practice is recommended for users who value more privacy control; or who doesn’t actually make use of Microsoft suits of cloud products and services such as OneDrive, Hotmail, Outlook, Skype; or who doesn’t need the Windows personalization sync and data backup features; or who prefer to sign into apps individually. Start the installation of Windows 8 / Windows 8.1 / Windows 10 as you would usually do, and follow on-screen instruction to proceed. 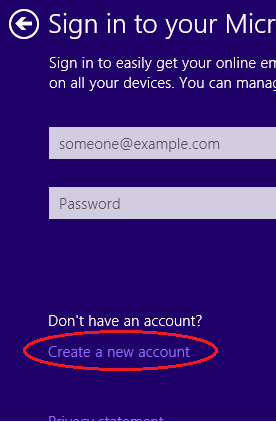 On the screen where you’re required to enter information to create a Microsoft account, scroll to the bottom, and click or tap on Sign in without a Microsoft account. 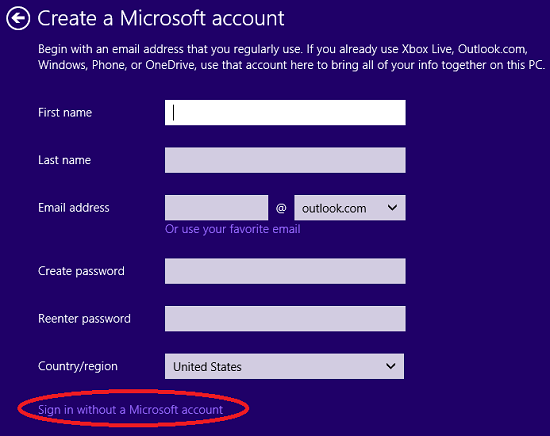 Enter your desired user name, password and password hint for the local account to be used to login to Windows OS. If you are not entering a password and create only the one local account, Windows will automatically sign in and boot to desktop or Start screen for you. Click or tap on Finish when done. Windows setup wizard will continue to complete the installation.